Continued from Teenage Mutant Ninja Turtles #5. The robot murders a man in a phone booth and then retrieves an address from the bloodstained phone book inside. April leaves the TMNT, Casey and Shadow in the apartment and heads to the grocery store. On the way, Casey’s car is attacked by the robot. The mechanical monster rips O’Neil out of the vehicle and injects something into her shoulder. As the police arrive, the robot tunnels underground and vows that this is but the beginning of the pain that it will bring to April. Casey notices the sirens and looks out the window to see April and the wreckage. Jones runs out of the apartment and Leo sends his three brothers to investigate while he stays with Shadow. April is explaining her story to a disbelieving police officer, but there are witnesses to backup her outlandish story. Two federal agents arrive and question April about the robot, but Casey angrily sends them away. As the men leave, one orders the other to run background checks on both April and Casey and to keep them under watch. Mike and Raph are in the sewers, trying to find clues. They hear some noise, but when they try to find its source, all they discover is that the sewer has been blocked off by rubble. 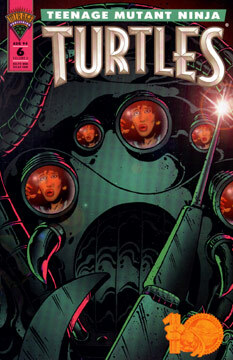 Continued in Teenage Mutant Ninja Turtles #7.